This Emperor moth (Saturniidae) wingspan is up to 13cm. the larva was found on Fraxinus americana (new host for this specie!). It will puptae underground and will emerge after about 6-7 month. known in Argentina from Buenos Aires and Entre Rios. I like a lot this macro. It's so well focused, plenty of details. The POV is so good, showing us a frontal view of the insect. The colors are well saturated, naturals, with no excess. The composition is very well balanced. at first I thought it was a flower, boy was I wrong. This caterpillar is literally creeping towards me. Great POV and excellent sharp details. Very well composed with a superp DOF and great colors. Una nueva imagen de Argentina estimado Oz... debes estar visitando Buenos Aires nuevamente. Excelente macro con gran agudeza, claridad y foco, gracias a un atinado DOF y punto de vista. Los colores captados son intensos, pero bien iluminados, sin excesos o sobre exposici�n. Me agrada el encuadre que elegiste para su presentaci�n. A new image of Argentina esteemed Oz... you should be visiting Buenos Aires again. Excellent macro with great sharpness, clarity and focus, due to a accurate DOF and point of view. The captured colors are intense, but very illuminated, without excesses or over exposure. I like the framng that you chose for their presentation. Impressive close-up! The POV is original and excellent. Good details on head and colors. THAT is an impressive macro, Oz. The details and exposure are spot-on. Fantastic POV showing all the bristles. I like a lot details which are very good here, especially if we note that it is not easy to keep good DOF in case of species with so many morphological structures on its body. 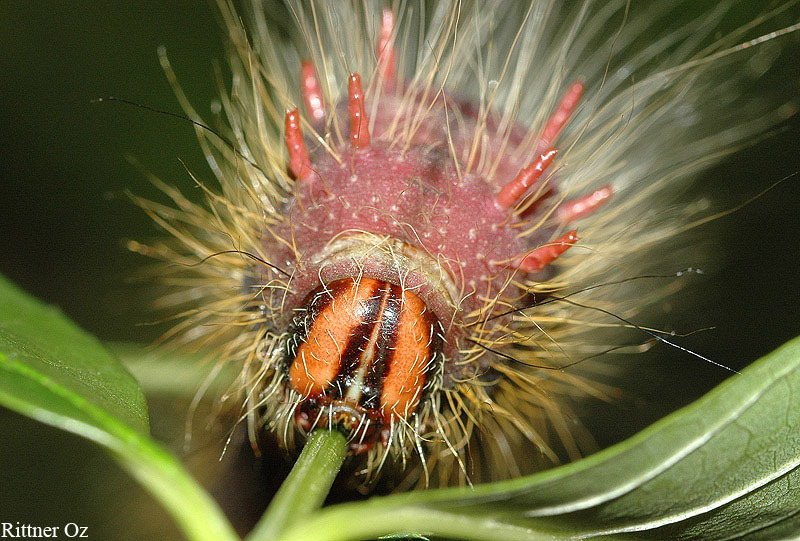 Really I also have to say that without your note I would not say that this caterpillar belongs to Saturnidae family. So thanks for interesting lesson of entomology!